If you’re a NASCAR aficionado, there’s little we can tell you about Talladega Superspeedway that you don’t already know. You already know its legends. You know how, from its first race in September of 1969, it was hailed as the most competitive, fastest, most intense stock car track in the world. You already know that the speedway was the brainchild of Anniston insurance executive, Bill Ward, who was a driver himself, and who saw a higher use for 2,000 acres of soybean fields. You already know about the harrowing pre-restrictor plate races; the speed records that were set, broken, and set again; and how dreams of winning at ‘Dega spawned the careers of entire families of drivers. So, we’ll skip the rest of the glorious historical details and drive straight into what you should do on Talladega weekend. 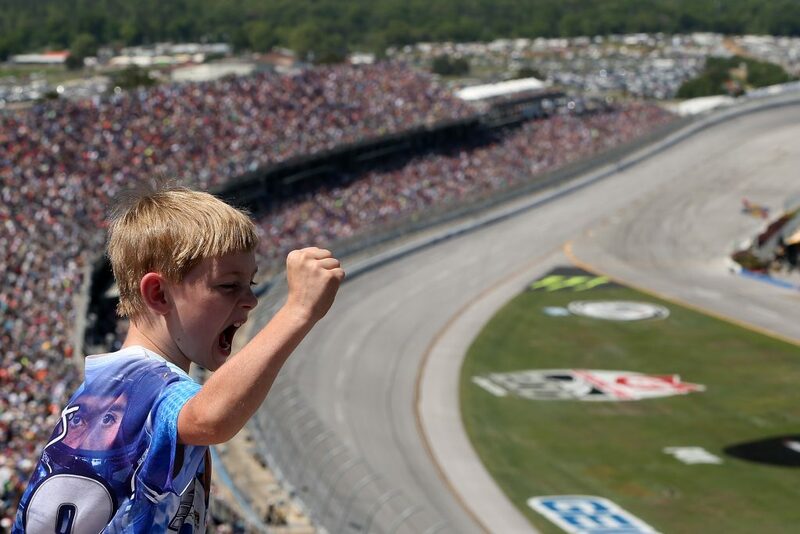 The folks who run Talladega have done a high-speed, low-drag job of crafting a race-weekend experience to fit the tastes of just about anybody. For example, if you like racing and camping, Talladega will definitely be your huckleberry. With acres and acres of campground, you can count on making friends with lots of folks who like to get there early and party hard well in advance of “GENTLEMEN, START YOUR ENGINES.” If you enjoy racing, camping, and you like it all a bit on the rowdy side, get yourself an infield camping pass and you can bet on an experience you’ll never tell your grandkids about. For the record, you can camp in the infield with a tent, a camper, an RV, or just about anything else you feel comfortable sleeping in… not that you’re likely to get a whole lot of sleep. At the other end of the spectrum, (for those who prefer their NASCAR gussied up a bit), there are packages ranging from seats under covered viewing areas with food, beer, soda, and water (along with a handful of other amenities), to suite packages that offer everything you’d find at the lower level served up in a climate-controlled luxury box, with access to the drivers, souvenirs, and all manner of bells and whistles. Bottom line, if you can dream up a race experience, Talladega has probably already packaged it for you. Here’s a good place to start when it comes to planning your ‘Dega trip. If you’re at ’Dega Friday night, and you’re in the mood to take your party to the next level, you’ll not want to miss the “Big One on the Blvd.” This 200-mile-an-hour bash in the infield begins with a parade of drivers tossing out beads and ends with all manner of fun and debauchery ranging from a race where four female contestants relay through a car wash in an attempt to clean car windows using their bodies as sponges, to an adult “Hungry Hippos” game, where contestants slide across a slip ’n’ slide to fetch their “dinner.” In short, the Big One on the Blvd – NASCAR’s own version of Mardi Gras – is Talladega at its most outrageous. Just remember: what happens in the ‘Dega infield stays in the ‘Dega infield. If you’re not planning to stay out at Talladega, but think you will have left the party behind as soon as you exit the grounds and jump on I-20, you’ve got another think coming. 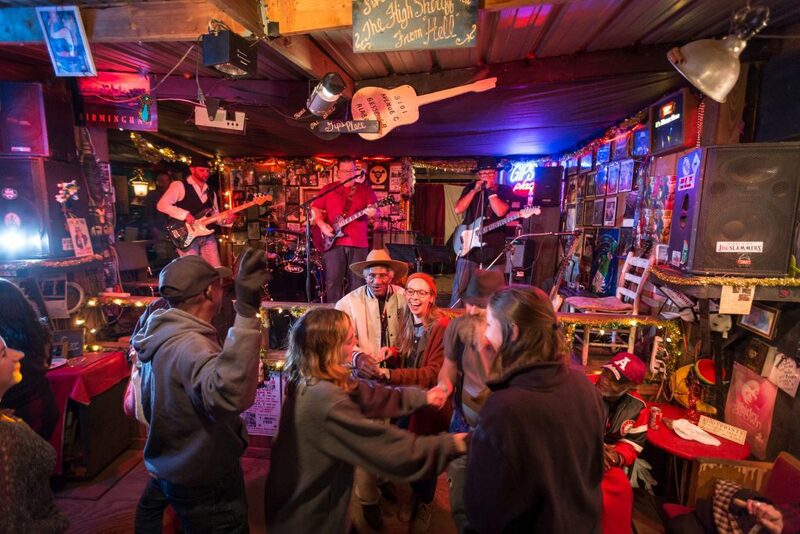 From cocktail bars, to dives, to live music, Birmingham’s got plenty of party going on just down the road apiece. Henry “Gip” Gipson at his club in Bessemer. When it comes to live music, Birmingham is the South’s best kept secret. Small, intimate venues are our bread and butter, and attract all sorts of acts, from the classic blues performers who come from all over the country to play at one of the last remaining true juke joints, Gip’s Place, and the jazz you encounter at Jazzi’s on 3rd, to the emerging bands and up and comers that play venues like Saturn, The Nick, Iron City, Zydeco, and Tin Roof. Even as of this writing, this year’s race weekend provides a few options. For example, on Friday night (10/12) at The Nick, you can catch Send Medicine, Dogwood Lung, Littleboybigheadandbike, and Make Sure; while over at Tin Roof, Nashville rising star, Faren Rachels will be playing. Meanwhile, at Zydeco, Beitthemeans will be hosting an album release show with Holiday Gunfire. On Saturday night at Zydeco, you’ll find the GlowRage Let’s Get Wild Paint Party Tour (think rockin’ music and flyin’ paint), while at The Nick, Moth Face, She the Devil, and Inclination of Direction will be jamming. And, don’t feel like you’ve gotta leave Sunday. Sunday night, we’ve got Kings of Spade at The Nick. And these are just what we know about right now. If you want more current info, visit Music BHam a little closer to race weekend. If you’d just as soon skip the live music after a day of listening to those 5.8 liter V-8s run, there are plenty of other party options. The cocktail scene is well shaken, with plenty of mixological delights to be found at Carrigan’s, The Atomic, Dram, The Louis, Lou’s Pub, 41st Street Pub, Paramount, The Collins, The Marble Ring, Pilcrow Cocktail Cellar, Tavern on 1st… the list is long and delicious (actually much longer and deliciouser than it makes sense to list here). And, if brews are what you’d choose, check out Avondale Brewing, Cahaba, Good People, Ghost Train, Trim Tab, Back 40, and Red Hills. The way breweries are proliferating around this city, there’ll probably be another one or two more by the time you read this. If dive bars are more your style, we’ve got a passel of those as well. You may want to check out the Oasis, the Brown Derby, Rogue, or Black Market (and there are plenty more where those came from). Lastly, if you’re feeling more active, check out Top Golf and The Woolworth, one of Birmingham’s newest playpens, where you can sip a cocktail while you bowl, get your foosball on, play ping-pong, or hit the shuffleboard tables, among other things. We could go on and on about food. They call us “the Dinner Table of the South,” and it’s no wonder, ‘cause we’ve got the complete range of food Southerners love to eat. We’ve got James Beard Award-winning restaurants like Highlands Bar and Grill and Hot and Hot Fish Club. We’ve got more barbecue than you can shake a spit at (here’s a great resource for checking out our barbecue scene). We’ve got soul food (look here), burgers (here), and just about anything else you’d ever dream of eating. Bottom line, if you’re going to be in the ‘Ham for the ‘Dega, make a little extra time to eat, drink, and get your party on. So, there you have it. VISITORS, START YOUR ENGINES.